Without a doctor or dentist's guidance, some parents don't follow national recommendations for early dental care for their children, a new national poll finds. One in 6 parents who did not receive advice from a health care provider believed children should delay dentist visits until age 4 or older -- years later than what experts recommend -- according to this month's C.S. Mott Children's Hospital National Poll on Children's Health. The American Academy of Pediatrics and the American Dental Association both recommend starting dental visits around age one when baby teeth emerge. "Visiting the dentist at an early age is an essential part of children's health care," says Mott poll co-director Sarah Clark. "These visits are important for the detection and treatment of early childhood tooth decay and also a valuable opportunity to educate parents on key aspects of oral health." "Our poll finds that when parents get clear guidance from their child's doctor or dentist, they understand the first dental visit should take place at an early age. Without such guidance, some parents turn to family or friends for advice. As recommendations change, they may be hearing outdated information and not getting their kids to the dentist early enough." More than half of parents did not receive guidance from their child's doctor or a dentist about when to start dentist visits. Among parents who were not prompted by a doctor or dentist, only 35 percent believed dentist visits should start when children are a year or younger as is recommended. Over half of parents (60 percent) reported their child has had a dental visit with most parents (79 percent) believing the dentist visit was worthwhile. Among the 40 percent of parents whose child has not had a dental visit, common reasons for not going were that the child is not old enough (42 percent), the child's teeth are healthy (25 percent), and the child would be scared of the dentist (15 percent). Experts say starting dental visits early helps set children up for healthy oral hygiene, with parents learning about correct brushing techniques, the importance of limiting sugary drinks, and the need to avoid putting children to bed with a bottle. Early childhood caries (dental decay in baby teeth) may also be detected at young ages, allowing for treatment of decay to avoid more serious problems. In young children with healthy teeth, dentists may apply fluoride varnish to prevent future decay. A quarter of parents who had delayed dental visits said their child's teeth are healthy but Clark notes it is unlikely that a parent could detect early tooth decay. "Parents may not notice decay until there's discoloration, and by then the problem has likely become significant," she says. "Immediate dental treatment at the first sign of decay can prevent more significant dental problems down the road, which is why having regular dentist visits throughout early childhood is so important." Another factor that may delay dental care is that healthcare recommendations for early childhood are often focused on well-child visits with medical providers, Clark notes. "Parents hear clear guidelines on when they should begin well-child visits for their child's health and often schedule the first visit before they even bring their baby home from the hospital. Doctors typically prompt parents to stick to a standard schedule for immunizations and other preventive care," she says. "Parents get much less guidance, however, on when to start taking their child to the dentist, with less than half saying they have received professional advice. This lack of guidance may mean many parents delay the start of dental visits past the recommended age." 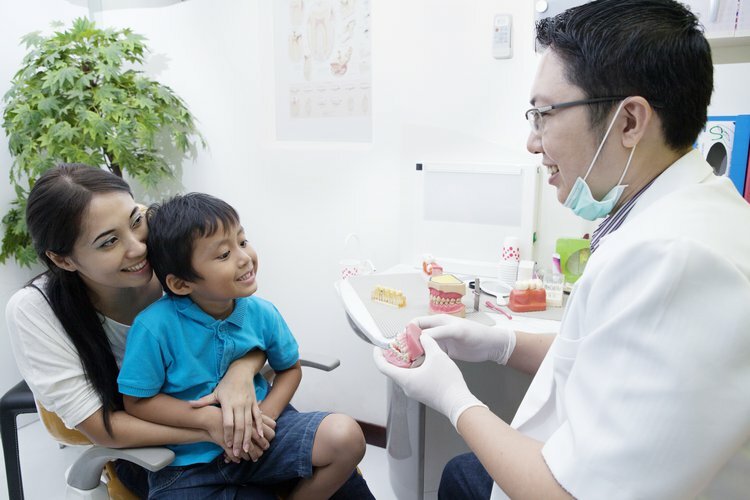 Parents with higher income and education, and those with private dental insurance, were more likely to report that a doctor or dentist provided guidance on when to start dental visits. "Our poll suggests that families who are low-income, less educated, and on Medicaid are less likely to receive professional guidance on dental care. This is particularly problematic because low-income children have higher rates of early childhood tooth decay and would benefit from early dental care," Clark says. "Providers who care for at-risk populations should dedicate time to focus on the importance of dental visits. Parents should also ask their child's doctor or their own dentist about when to start dentist visits and how to keep their child's teeth healthy." Michigan Medicine - University of Michigan. (2018, February 19). Lack of guidance may delay a child's first trip to the dentist: Less than half of parents received guidance about starting dental visits from a doctor or dentist, worse among low-income parents. Retrieved March 4, 2018. Materials provided by Michigan Medicine - University of Michigan. Note: Content may be edited for style and length.